Gujarat State Electricity Corporation set up a solar thermal air conditioning system as part of its clean energy initiative last August. The installation offers a capacity of 150 tons of refrigeration (528 kW) to cool the Gandhinagar Thermal Power Station’s office building in Gujarat state in western India. The total investment, including the collector field, mounting equipment, chiller and hot water storage tanks, amounted to Indian Rupee (INR) 52 million, or around EUR 0.7 million, which corresponds to specific costs of 1,327 EUR/kW. The project received INR 16 million in federal subsidies and is expected to pay off over 6 years. The office building in need of cooling has 2,000 m² of floor space. Gujarat State Electricity Corporation Limited, or GSECL, said that the installation saved 250 MWh of electricity per year. It is connected to the existing cooling plant, powered by electric compression chillers. The solar cooling system comprises 525 vacuum tube collectors with CPC (Compound Parabolic Concentrators) which have an aperture area of 3 m² each, bringing the total up to 1,575 m². Owing to space constraints, 131 collectors were installed on a terrace, while the remaining units were set up on the ground. The system supplies hot water at 90 °C to a new vapour absorption machine. In summer, this machine can lower the water temperature to 7 °C. The entire installation was delivered by German-Indian joint venture VSM Solar, headquartered in Bengaluru, the capital of Karnataka state in southern India. The chilled water from the vapour absorption machine circulates through three air handling units, which are part of the existing system and supply conditioned air to the building. Buffer tanks help store solar-heated water on non-working days to offer even more comfort the next day. Backup electrical heaters ensure that the thermal-driven absorption chiller operates the entire time, even when the sun is not shining. Bela Jani, Executive Engineer at GSECL, told officials from the Solar Energy Corporation of India during an inspection visit that the company saw solar thermal as a promising solution for heating and cooling. “Air conditioning made up a major proportion of our electricity expenses, so we researched some more and visited several solar thermal cooling plants which have already been put into operation,” Jani said. Ultimately, GSECL started to invite tenders and awarded a contract to VSM Solar to supply and install the system. 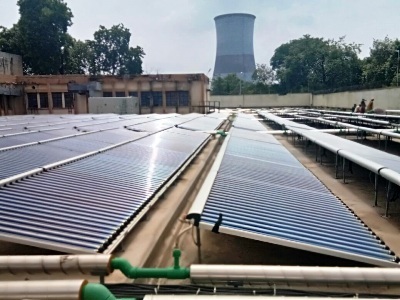 The engineer said that it had been the first-ever solar thermal cooling installation on a government building in India. VSM Solar is a joint venture formed in 2011 between Indian-based VSM Energy and German research institute Fraunhofer, which owns a 25 % stake in the company. The aim of VSM is to design, manufacture and install solutions for solar air conditioning, refrigeration, cold storage and other applications in India, Sri Lanka and Bangladesh.